Computers have become vastly more complex than 8- and 16-bit machines of yesteryear, which had the advantage of being much simpler to program than their modern descendants. That’s what led Konstantin Dimitrov to design the Ello 2M, a DIY retro computer that you can build yourself and use to design programs in BASIC and test out electronics. 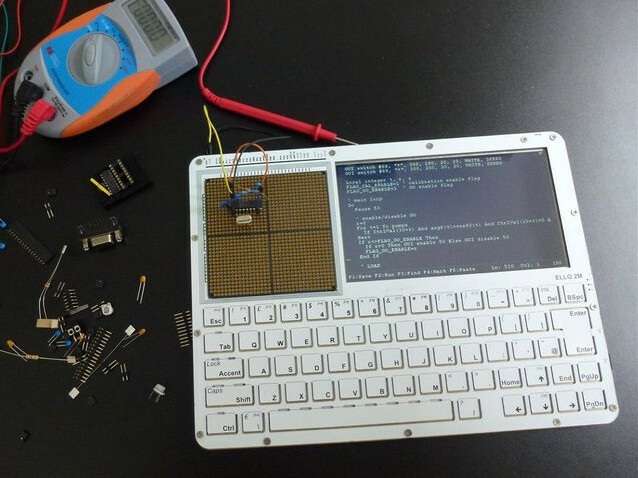 The Ello is made up of six stacked circuit boards, a 7-inch LCD touchscreen, a full keyboard, and an electronics prototyping board with as many as 1,156 holes for testing out electronics. Inside it packs a 32-bit PIC32 micro-controller, 128kb RAM, a 2.4GHz radio frequency module, three microSD card slots, and a 4500mAh battery. The CrowdSupply page says you can use it to design computer games, develop your own expansion boards, or prototype electronic circuits and control them with programs written on your Ello. Dimitrov is currently running a fundraising campaign for the Ello on CrowdSupply, where a $65 pledge will get you a basic, unassembled version of the computer. If you’re willing to dish out $180, you can get a fully assembled Ello without a prototyping board when it ships this summer. And $240 gets you a complete system signed by Dimitrov himself. The entire project is also open-sourced on Github, so you can take a shot at ordering the various components and soldering the whole thing together yourself.